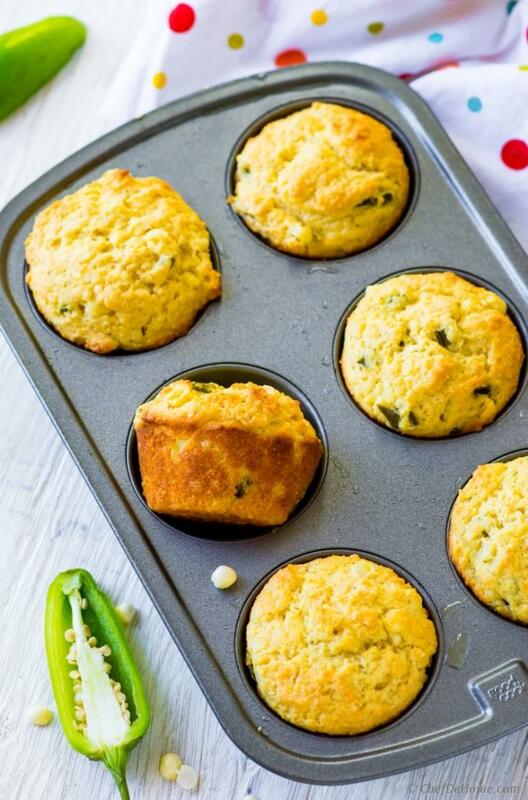 These Jalapeño Cornbread Muffins are moist and sweet with kick of jalapeno! Perfect to scoop bean chili or dunk in tomato soup! Slightly sweet and amazingly moist Jalapeno Cornbread Muffins made with fresh corn, corn meal, and jalapenos. Sweetness of two kinds of corn, hint of salt, and heat of Jalapeno chili.. You guys! 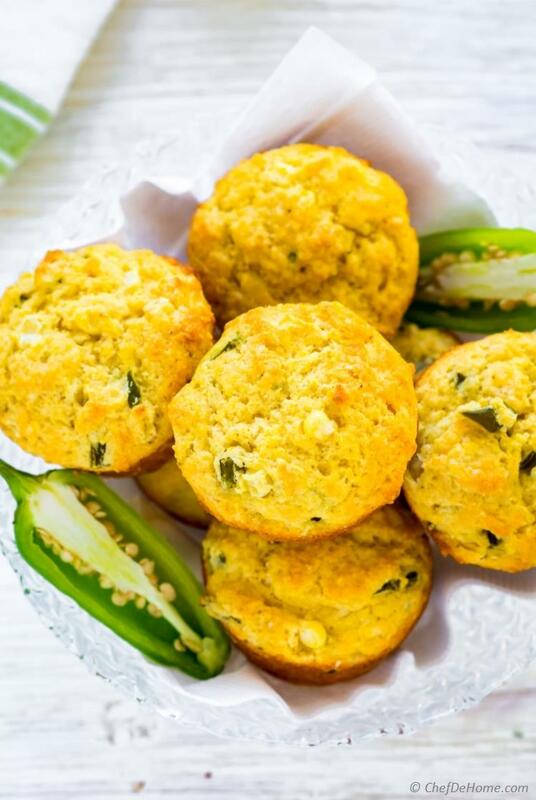 This tex-mex recipe is keeper for all savoury corn muffin lovers! Can you believe this need only 10 minutes prep? Just 10 minutes and 22-25 minutes of baking and fresh warm bread to serve with your favorite soup! 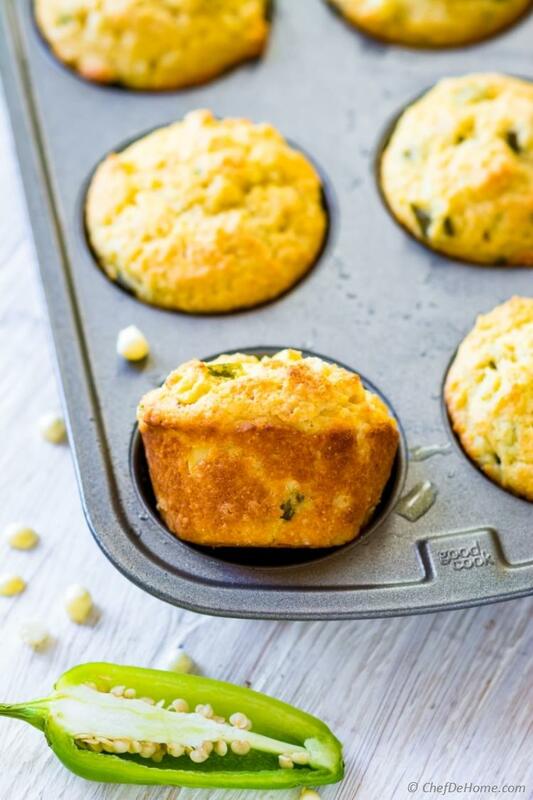 All you need is: a whisk, a bowl and a muffin tin… and simple cornbread muffin ingredients: one corn on the cob, corn meal, AP flour, jalapeno, egg, buttermilk, and baking powder! Best part is: even though easy to put together, these muffins are no comprise in flavor. 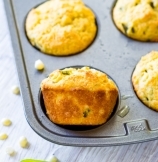 Try these once and you will forget cornbread muffin mix… for good! I promise! I love serving bread on the side of a soup. Every hearty soup needs a crusty and delicious bread to scoop all the goodness. When I prepared Pasta Fagioli last weekend, I served Jalapeno Corn muffins on the side. If you wondering, why Italian soup and southern corn bread?? Well, I love a good crusty sweet jalapeno cornbread with beans chili. The creamy beans soup reminded me of a hearty beans chili and I could think of only one bread to compliment it: sweet cornbread. Since the soup wasn't very spicy, the jalapeno in corn muffins made every bite scrumptious! I finished two corn muffins with one bowl of soup and was still craving for more. To me, there is nothing like cornbread with corn and jalapenos. I enriched corn muffins with corn, usually fresh corn from a cob, for texture and jalapeno for savoury surprise. When corn is not in season… sometimes I use unsalted sweet canned corn too. When muffins cook in oven, corn kernels become juicy and soft. They burst in mouth when you bite into a warm sweet cornbread muffin… omg! my favorite!! Cornbread or corn muffins, one ingredient that I always add to muffins is - buttermilk. The tang and fat of buttermilk gives amazing lite and moist texture to muffins. Tell me who does not like a moist cornbread? Ask me? I adore it! Note: When I'm out of buttermilk, I substitute it with non-fat diluted yogurt. Smart Swap For a variation, replace jalapeno with chopped sundried tomatoes! 1. Prevheat oven at 400 degrees Fahrenheit. 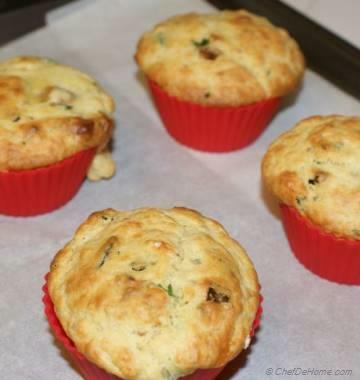 Spray muffin tin with cooking spray or line with muffin liners. Set aside. 2. In a medium bowl or paper plate, mix dry ingredients with a whisk or fork. 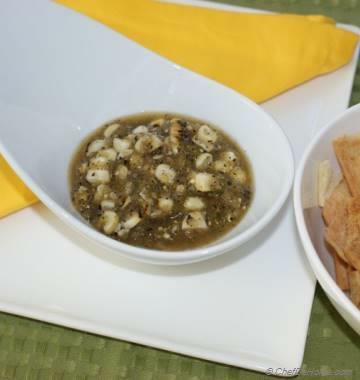 Fold in chopped jalapeno and corn kernels and set aside. 3. In a wide bowl, add wet ingredients - eggs, melted and cooled butter, olive oil, and buttermilk. Whisk until eggs are very well blended with buttermilk. 4. 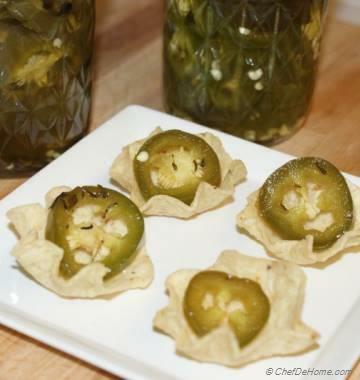 Add dry ingredient + jalapeno mix in wet ingredients and fold with spatula gently until just combined. Scoop into 11 muffin cups and bake for 22-25 minutes or until tooth pick inserted in middle comes out clean.